My original plan to wrap up the 30 Character Challenge was to end it on the first comic I actually completed, a comic called Rawni. The series was to be an epic fantasy that was an allegory to the biblical war between Heaven and Hell, then was to be restarted as a story serving the origin of myths with these characters being a new race of beings, akin to the Asgardians in Marvel. Unfortunately, I did not manage my time well and my job dominated much of my time that even holidays were not enough to complete it. So, in closing, if I intend to succeed in these challenges in the future, time management is key. Now, here we have the leader of his unit, Pakhawaj. A child drummer for a time until he was foretold that he was destined to rule with the prophecy that, " He is the Sun that shall overtake the Moon and his reign will eclipse all around." Emboldened by this declaration, Pakhawaj has worked to show that he is leader the kingdom of Kalon needs, and is critical of Oscuros's Amonrae's leadership. Pakhawaj was raised overseas from his former homeland and was taught in Kalon while the realm was in its infancy. The series was set to focus on his quest to start a new realm with members of his own unit, proceed to overthrow the current regime and place his own team in power to become the new Amonrae. 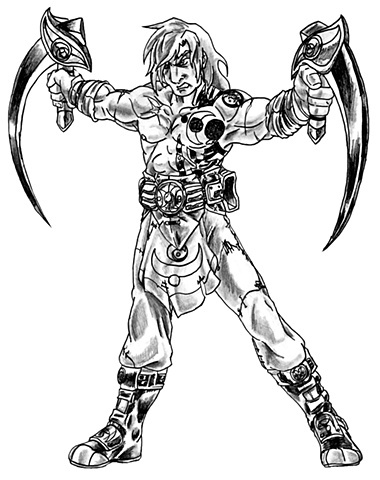 My design for him was an updated look from his previous appearance, as he was depicted in tribal pants, the tattoo over his chest, his bracers, and the crescent scythes that he dual wields. The recent updates I have done are inspired from Khal Drogo's design in Game of Thrones, particularly in redesigning his belt and adding the loin cloth on his body. I changed his hair style to look less like a cockatiel and added scars across his body. I gave him the "come at me bro" pose to demonstrate his more fiercer side as a warrior before he becomes a stoic leader.